Finally dresses are back in fashion and are so feminine.To me femininity inspires thoughts of nature, flowers and butterflies. So, with that in mind, and sticking to a big trend of monochrome I have made a very feminine 24" necklace with sterling silver clasp, made entirely of swarovski beads. 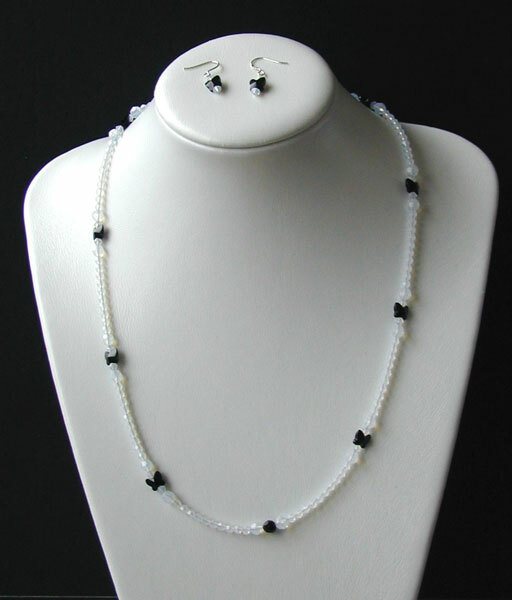 I have used graduated white opal swarovski beads which give a ghostly effect and make a big contrast to the 8mm jet black swarovski butterflies which have been interspersed around the necklace. To accompany the necklace I have also made matching sterling silver, half inch drop earrings.These are made up of the same small white opal beads and black swarovski butterflies.